Ho Ho Ho, H2Oh No! Rain on December 23 near the HarborLAB launch. Photo by Erik Baard. Midtown rain on December 23. Photo by Erik Baard. New York City has a combined sewer system, meaning that water from rainfall and household use flow though the same pipes to treatment plants. That can be a great thing when compared to municipalities that allow much of their stormwater runoffs carrying metal dusts, oils and other lubricants, solvents, and various pollutants from cars and trucks to pour straight into waterways. In NYC that water is caught and cleaned before release, if rainfall is light. Unfortunately, however, any significant rainfall overwhelms our century-plus-old system. In order to prevent backups 27 billion of gallons of raw sewage are released into the estuary annually. Because of this flaw, each year NYC fails to comply with requirements established by the Clean Water Act. There are two basic solutions: Build more treatment plants and containment basins (“gray infrastructure”) or grow more green roofs, bioswales, and other planted areas (“green infrastructure”). A third and smaller part of the solution is to build more cisterns, which can catch rainwater for later use in gardens and nonpotable applications. Even our massive drinking water reservoir system has limited storage capacity. When a reservoir is topped off, excess must be released into rivers that bypass millions of thirsty New Yorkers, and ultimately empty into the estuary. So how can we bank away water as a hedge against future shortages? Snow! Our state’s snow-capped mountains slowly release water as they thaw, providing steady supplies for months. If our winter persists with rains more than snow, we could face challenges in 2016. This happens to be a very rough El Nino year, which certainly contributed to North America’s rash of unusual weather. But this season’s confluence of extreme weather — a wintertime Arctic thaw, record warmth in our region, unprecedented flooding in the heartland, and a swarm of deadly tornadoes — aligns with the warnings atmospheric scientists have sounded for years about anthropogenic climate change. According to the World Meteorological Organization (part of the United Nations) this was the warmest year since records were first kept in the 19th century. More quietly we’re also contributing to ocean acidification, which causes coral reefs to die and shellfish populations to struggle. HarborLAB will continue to advocate for climate change awareness in 2016. We’ll plant more seedlings, saplings, and seeds than ever before. We’ll introduce more New Yorkers to our estuary and reservoir systems through unique paddling programs. We’ll excite more kids about environmental science so that they enter careers that could help heal the world. And we’ll hope. Help HarborLAB Buy its 2016 Plantings! We’re excited to be spartin’a New Year! Please use your year-end tax-deductible donation to purchase indigenous seedlings for HarborLAB and our young partners to plant throughout our estuary! Your donation to the Natural Areas Conservancy in HarborLAB’s name will reserve 1,000 plugs of spartina saltwater marsh grass seedling plugs and thousands more seedlings and seeds from the Greenbelt Native Plant Center of the NYC Department of Parks and Recreation. We then work with city, state, and federal park agencies and conservation groups to provide free environmental science programs for NYC youth from lower-income families. The Greenbelt Native Plant Center will reserve 1,000 spartina plugs for HarborLAB if we raise $750. Our total plant budget goal is $2000. We’ll gratefully receive your small individual contribution. Corporate volunteer teams might wish to consider sponsoring the whole lot! And we welcome sponsors and proven volunteers to join us as we venture out on planting days! All donors contributing more than $100 get special benefits from the Natural Areas Conservancy. 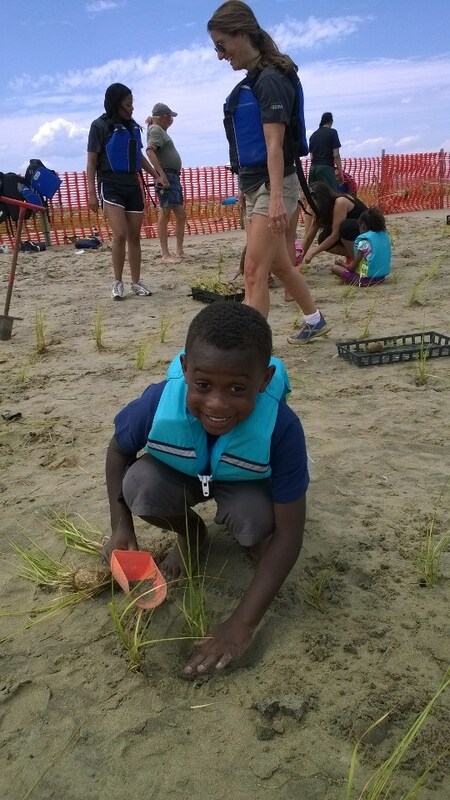 One of our favorite activities is to paddle with Hour Children (a group serving kids who were born in prison or whose mothers have been incarcerated) to plant spartina on mud flat islands in Jamaica Bay. HarborLAB is also transforming a stretch of the Newtown Creek (a federal Superfund environmental cleanup site) into a place of beautiful life and learning. Help these kids have an unforgettable science education experience! Be part of the green and blue revival of NYC for a healthier, more sustainable, and more resilient future! THANKS! And all joys to you in 2016! Hunters Point Community Middle School students gathering goldenrod seeds with HarborLAB, helping the environment in view of the United Nations. Photo by Erik Baard. HarborLAB volunteers had a wonderful day gathering seeds in Hunters Point South Park with a Hunters Point Community Middle School science class. We conceived and operate our seed program as a means of restoring and strengthening estuary habitat. We’re advised by local conservation groups and agencies, and in our field work we partner with school groups, corporate volunteer teams, and residents. We’ve partnered with HPCMS since before it even opened its doors. The school has an ecological focus and serves special needs students, like our seed gathering partners, along with those in the mainstream. The student population is very diverse and most come from lower-income families. Mary Mathai’s students met us in the park across from the school on a mild and partly sunny December afternoon. The weather has been so warm that many flowers have yet to slip into seed-heavy dormancy. We focused on a thicket of seaside goldenrod (Solidago sempervirens) which fortunately had largely turned over to fuzzy seed. We’ll return to the school to make seed balls with our day’s collection, and plant them along shorelines throughout our estuary as we paddle in 2016. HarborLAB Founder Erik Baard talks about beach rose to Hunters Point Community Middle School kids. Photo by Patricia Erickson. On the way to our goldenrod quarry we visited beach rose, pitch pine, and what are commonly called North American asters. Beach rose (Rosa ragusa) isn’t native, and is categorized as invasive along much of the East Coast. But in Hunters Point South it’s decoratively planted. The rose hips provided a great chance to talk about nutrition (especially vitamin C) and seed distribution by endozoochory (dispersal by animal ingestion and defecation). Pitch pine (Pinus rigida) is a tough native tree with twisting branches. It grows in poor soil and forms the core of the famed New Jersey Pine Barrens. This species allowed us to talk about forest regeneration through fire because this tree tenaciously regrows after damage and its cones pop open to released winged seeds after being exposed to high heat. Because of our region’s record high temperatures this autumn, many flowers were North American asters were determined in 1994 to not be true asters at all, but were instead categorized under the genus Symphyotrichum. The new genus is still under a family named for the asters, Asteraceae, along with daisies, sunflowers, and many other important flowers. Many thanks to volunteers Patricia Erickson, Diana Szatkowski, and Erik Baard. Deep gratitude also to Hunters Point Community Middle School science teacher Mary Mathai and Principal Sarah Goodman, and to NYC Department of Parks and Recreation western Queens park manager Norman Chan for access and to the Natural Resources Group of the department for guidance. Goldenrod in flower and seed. Hunters Point Community Middle School student outing with HarborLAB. Photo by Erik Baard. Count goldenrod among the Asteraceae too! Goldenrod has long been recognized as a medicinal plant and recently urban planners have appreciated its ability to stabilize shorelines and dunes. Goldenrod is important to many animals. It feeds butterflies and bees, and hosts host the Goldenrod crab spider (Misumena vatia), which can change color to camouflage itself against its insect prey. Goldenrod also shelters the nests of black skimmers, one of our region’s most fascinatingly adapted shorebirds. The kids quickly grasped how the puffy seed heads acted as parachutes or sails to help carry the plants’ next generation far away. No need to worry about this goldenrod stand being diminished — these are perennials and we left many seeds at the site to boot. Hunters Point Community Middle School students with the seeds they gathered. Photo by Erik Baard. HarborLAB Facilities Manager Patricia Erickson shows students how to gather seeds without scattering them to the wind. Please find below a draft agenda for our volunteer and student year-end meeting. Please forgive formatting issues and feel free to email suggestions to harborlab@gmail.com. Note that this agenda is more detailed than the one posted to Facebook earlier and circulated among some administrative volunteers. We encourage HarborLAB volunteers, educational partners, and the students we serve to participate in our 2015 review meeting. We’ll also look ahead to 2016! It’s not too late for you to suggest additions and amendments to the agenda! Help prepare an update to the HarborLAB board. In turn, the board will use this document as a draft for our official annual report to the community and sponsors. a. Account activity, balance. Note: Funds owed to some volunteers, especially Patricia Erickson. Receipts needed. b. Urgent: Bookkeeper needed for routine updates. CPA needed for board or for annual filing and further organizational development. c. Prospects and fundraising approaches: Events, special tours, sponsorships (especially renewals) grants, Foundation Center, crowdfunding, program and facilities branding. d. Insurance for 2016 prepaid. II. 501(c)(3) Incorporation and Governance. a. Proposed: Student and Volunteer seats on the board. The board maintains the power to select new members. Students and volunteers will nominate or self-nominate to serve. Questions: Is this desired as described in part or entirely? What qualifications should be required, or should this position be open to all? b. Distribution of NY State Incorporation papers from 2012. Volunteers and students are invited to review and suggest changes based upon our greater experience with actual programming. c. Legal team overview: Tushara Saint Vitus, Sally Attia, Board member Joel Kupferman. d. Urgently needed: CPA for application. Snafu: 501(c)(4)? a. Site cleared and organized to prepare for winter and new assets. b. Vernon Blvd butterfly bioswale (swamp milkweed) proposal. c. Gardening progress and plans: “Fig Fish” planter, soil slope, native plants, tree planting and pruning. d. Water supplies: Collection, distillation, and NYCDEP permit. IV. Infrastructure. Patricia Erickson, Facilities Manager. a. Security cameras. Budget and installation info. b. Dock status. Related: Sunken sailboats. c. Security cameras. Budget and installation update. d. New structures: Field station, lab, boat storage (including private), boat building shed, composting toilet, shower. Design and budget teams needed for projects in sequence. e. State of boats and repair/maintenance needs. b. Student and community group outings. Esp. CUNY, Hour Children, East Harlem youth groups, public school visits. c. Seed gathering and seed ball making. d. Water quality sampling and testing: Gantry and Hallets. Next, microbeads? Statement from Josue Silvestre. Internship program for 2016? e. Opportunities at Gantry, Lemon Creek, Orchard Beach Lagoon. f. Spartina budget and plan. g. Talks and presentations, Libraries, NWF, etc. a. Diversity efforts. Serving a diverse community through schools, CUNY, and Partner Paddles. HarborLAB leadership is already far more diverse than most groups on the harbor, but how we can cultivate an even more diverse next generation? Engagement and retention of youth from underrepresented cultures. c. New literature? Regular press releases? d. Maximize online presence: Twitter, Instagram, YouTube. We’ve dabbled but need a more concerted effort. VII. Tours, special programs and events. a. Gantry. Need volunteer to organize and count waivers. c. Urgent: Neversink Reservoir team needed. d. Slate of events — Clearwater, City of Water Day, Swim Across America and other cancer swims (how can we tie this to education about environmental factors? ), Night Circ, other? e. Camping beyond Clearwater and City of Water Day? f. Boat building, at last? g. Trip proposals from the group! Survey? Work party on Sunday (Dec 6, 11am–4pm)! Slumber comes upon our green and sunny launch, but let’s tuck our boats in smartly! Come help organize the site and safeguard our fig trees against frost. We’ll have pizza and hot chocolate or whatever the group decides upon. Bring music if you can! If you can’t come for the whole day, swing by for the hours you can. Thanks! 1) Organize the sheds.Move items not prone to theft outside in bins. 2) Sort through materials on site. Repair or dispose. 3) Protect the figs if leaves have dropped. 4) Install cameras and secure bins. All hands needed and newcomers gratefully welcomed! Below is a DRAFT of testimony that was slated to be offered on Dec. 9, 2015 by HarborLAB Executive Director Erik Baard to the City Council Committee on Waterfronts regarding proposed changes to the Waterfront Management Advisory Board, which has been inactive since 2013. The meeting has been postponed and not yet rescheduled. Please use this time review our draft and email baard@harborlab.org with your suggestions. Good morning. I’m the founder and executive director of HarborLAB, a volunteer group dedicated to environmental education through service learning. One of HarborLAB’s primary missions is to extend classroom curricula onto the water by use of our canoe and kayak fleets (totaling 40 boats). We bring adults out on adventures across the harbor, and children to where water is cleaner and less trafficked. In coordination with the NYC Department of Parks and Recreation, the NYC Department of Environmental Protection, and other conservation agencies and organizations, we clean shorelines and plant native species for habitat and coastal protection. We also frequently visit classrooms to provide activities and presentations. 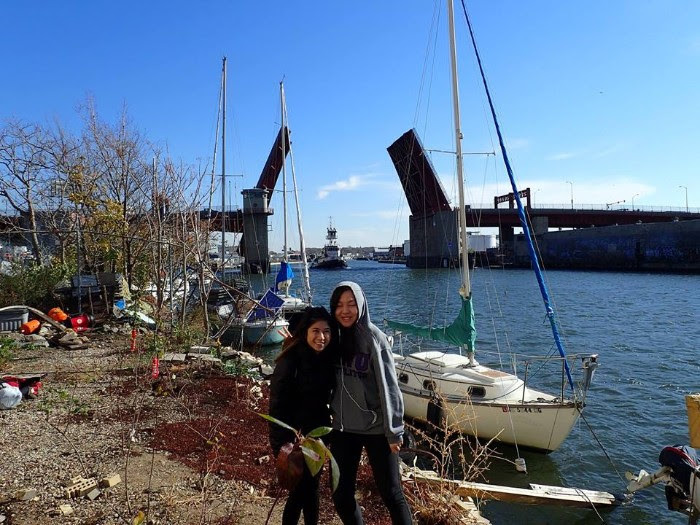 At our GreenLaunch on the Newtown Creek in Hunters Point, LIC in Queens (District 26) we are growing a unique marine-to-uplands habitat area and orchard for public enjoyment and education. This is a unique asset on the waterway, a US Environmental Protection Agency designated Superfund cleanup site. We thank City Council Members Kallos, Rose, Koo, Chin, and Vallone for their proposals to revive and improve the Waterfront Management Advisory Board. We thank City Council Members Van Bramer and Constantinides for their ceaseless efforts to improve ecology and access along the western Queens waterfront. We thank Waterfront Alliance for keeping all stakeholders informed about this meeting. 1) Establish a NYCHA Resident Association seat. NY Harbor life and leadership don’t adequately reflect the ethnic, cultural, and economic diversity of New York City. This warrants special efforts toward inclusion. Because earlier administrations concentrated public housing on waterfronts that were at that time neglected, lower-income New Yorkers in NYCHA developments are more vulnerable to storm surge. The danger of flooding will grow throughout this century. New York City Housing Authority residents are also more likely to have marine transfer stations, ferries, power plants, and other impactful infrastructure near their homes and parks. NYCHA residents are well-positioned to benefit from STEM (Science Technology and Math) inspiration and healthy recreational opportunities on our estuary. NYCHA residents are also more likely to be non-white than most other harbor stakeholders identified by legislation establishing the Board. NYCHA resident associations elect leaders for each development, and these leaders form a Citywide Council of Presidents. The Waterfront Management Advisory Board should reserve a seat for a person representing the NYCHA Citywide Council of Presidents. 2) Create a standing Environment Committee. Environmental concerns uniquely thread through the labor, maritime, transportation, hospitality, and community sectors listed as other harbor stakeholders. An environment committee promises to be effective given the proven professionalism and abilities of academic researchers from NYC’s acclaimed universities, a growing pool of sustainability officers in private industry, and longstanding advocates like Natural Resources Defense Council, Riverkeeper, etc. A second standing committee (in addition to the existing recreational uses committee) would help ensure that the Board doesn’t fall into dormancy again. 3) Mandate that Board meetings be open to the public. The semi-annual meetings should be held in a venue where the public could observe discussions, and then comment for the record after. It was not clear to us in the proposal how open and transparent the Board would be. 4) Mandate that the standing committees (Recreational Uses and proposed Environment) meet at least quarterly. These standing committees should meet at least quarterly, and may vote to meet more often. This would invigorate the entire Board, and also allow it to catch up on issues of a growing constituency whose needs hadn’t arisen as often during the 20th century. We believe these measures will help ensure that the Waterfront Management Advisory Board is more inclusive, dynamic, and just.